Those who battle MS need hope and strength to combat and live with their disease. This awareness sun catcher is a piece of decor that will provide that inner strength and courage daily. Every time the sun catches it, they'll remember how strong they are and how they can fight this, one step at a time. Engraved Oval Glass Suncatchers measure 3.75" x 2.75” and include a suction cup to hang from any window of your home. 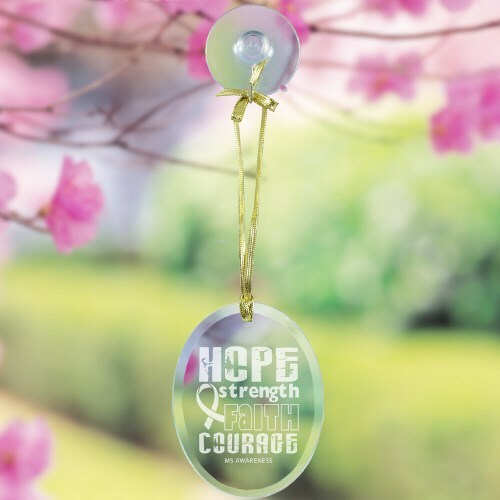 Our Personalized MS Awareness Keepsake includes a golden ribbon loop to easily hang from the suction cup & a free gift pouch to create a wonderful presentation. Today’s Price: $18.96 In Stock! Additional Info Our MS Awareness gifts are not only designed to educate others about Multiple Sclerosis and its impacts and symptoms, but also to provide hope and strength to those currently fighting the disease. Great as Multiple Sclerosis Gift Ideas for a walk or fund-raiser. This sun catcher is a subtle piece of home decor that will provide that positive reminder each day. Our Bee Mine MS Awareness Oval Keychain is another accessory that will spread the word about MS.